Uhuru Kenyatta delivers a consummate clarion call. 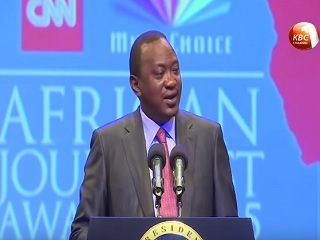 At the recent CNN MultiChoice African Journalist Awards ceremony in Nairobi, Kenya, the country’s president Uhuru Kenyatta delivered several impassioned messages to the crowd at hand. The ceremony was held at the Kenyatta International Convention Center, a facility named after his father. That mental maps reference reflects Kenyatta’s very clever framing of his speech. He tied his observations to the recent discovery that elephants rely on elaborate ‘mental maps’ of their chosen terrain to navigate, survive and thrive. This year’s ceremony was the 20th anniversary of the CNN MultiChoice African Journalist Awards. Bravo to President Kenyatta for this incredible speech, and congratulations to all of this year’s nominees and winners.